Help us win the Outdoor Campus Challenge! An Outdoor Pursuit excursion in the woods. The College is entering the race to become America's most outdoorsy school, as designated by the 2015 Outdoor Nation Campus Challenge. 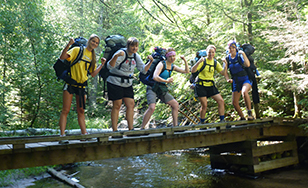 St. Scholastica is competing with 56 other schools in 31 states to win the title of National Outdoor Champion in a six-week competition. The winner will be determined by the number of outdoor activity hours logged by participants. The activities could include anything outside, from rock climbing to relaxing in a hammock, and participants don't have to be part of the College community. "Anybody that wants to represent St. Scholastica in the challenge can," said Shawn Olesewski, Outdoor Pursuit director and contest coordinator. Registration is open at www.oncampuschallenge.org. The contest runs through Oct. 17. Every time a registrant performs an outdoor activity, the College gets 10 points, up to 50 points a day. Schools in the contest receive grant funds in increments of $500 up to $1,500 based on their number of active participants. Along with bragging rights of being named "National Outdoor Champion," the winning school receives camping and outdoors gear from contest sponsors. The person from each college with the most activities points will also win her or his own set of gear. The contest is a natural fit for participants in St. Scholastica's Outdoor Pursuit program, which Olesewski points out provides more than just a love of the outdoors for students. "It's a chance for them to build community with other students," he said. "We get them away from their screens, and they have face-to-face interactions and conversations. We get them talking to one another, building those relationships." Outdoor Pursuit activities include stand-up paddleboarding, horseback riding, hiking, kayaking, ice climbing, camping and more. Outdoor Nation was created by the Outdoor Foundation, a national nonprofit dedicated to inspiring and growing future generations of outdoor enthusiasts.